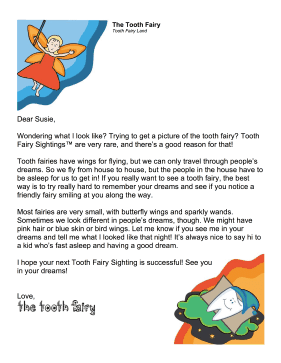 Children who are eager to see the tooth fairy are encouraged to seek her out in their dreams in this printable letter. Wondering what I look like? Trying to get a picture of the tooth fairy? Tooth Fairy Sightings™ are very rare, and there's a good reason for that! Tooth fairies have wings for flying, but we can only travel through people's dreams. So we fly from house to house, but the people in the house have to be asleep for us to get in! If you really want to see a tooth fairy, the best way is to try really hard to remember your dreams and see if you notice a friendly fairy smiling at you along the way. Most fairies are very small, with butterfly wings and sparkly wands. Sometimes we look different in people's dreams, though. We might have pink hair or blue skin or bird wings. Let me know if you see me in your dreams and tell me what I looked like that night! It's always nice to say hi to a kid who's fast asleep and having a good dream. I hope your next Tooth Fairy Sighting is successful! See you in your dreams!